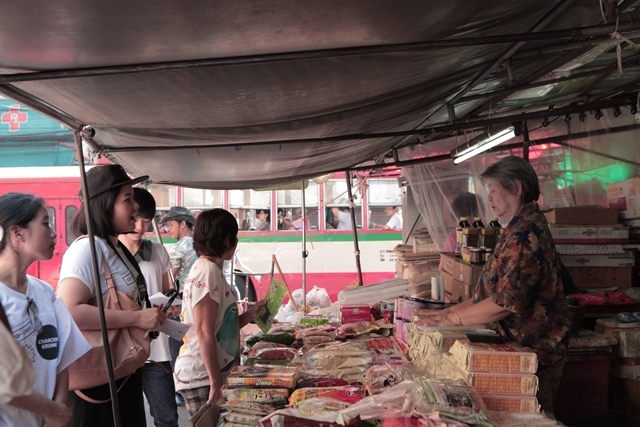 As part of the By people/In Cities series, ASEF culture360 contributor David Fernández takes a closer look at the Charoenkrung Project in Bangkok, Thailand. He talks about it with Charintip Leeyawanich, Policy and Development Manager at the Thailand Creative and Design Centre (TCDC). David Fernández: How would you describe Charoenkrung and its recent creative evolution? In my opinion, it is mainly the cultural assets of the district that make this part of town historically creative. Ever since its origin, Charoenkrung Road, the old riverside road, has been a thriving melting pot of architecture, arts, crafts, culture, religion and commerce. It is indeed an urban gem, an area firmly rooted in the past while looking to the future. Today, Charoenkrung has emerged as a district that is physically ready for development and full of historic legacy that can express its identity. Its present state still maintains the charms and stories that await new discovery in the modern context. For instance, the Chao Phraya riverside space provides old architectures, easy access to public transport on land and water, a strong art and design business district, as well as a hub of cultural learning resources. DF: What is the main motivation behind the Co-Create Charoenkrung project? The Co-Create Charoenkrung Project was born out of a collaboration between the Thai Health Promotion Foundation (ThaiHealth) and Thailand Creative & Design Center (TCDC) to develop the Charoenkrung area into a creative district which serves as a model for creative economy growth and fulfills physical, psychological, economic and social needs. Through a series of creative activities jointly conducted with local residents, we have used the “Design Thinking” methodology to explore the problems and solutions that address the community’s needs. We have also collected stakeholders’ opinions to make sure that no one is left behind in the creative space co-creating process. DF: What are the most important focus points of this on-going study project? The Creative Charoenkrung Project aims to develop the Charoenkrung area into a model for creative district development in Thailand. 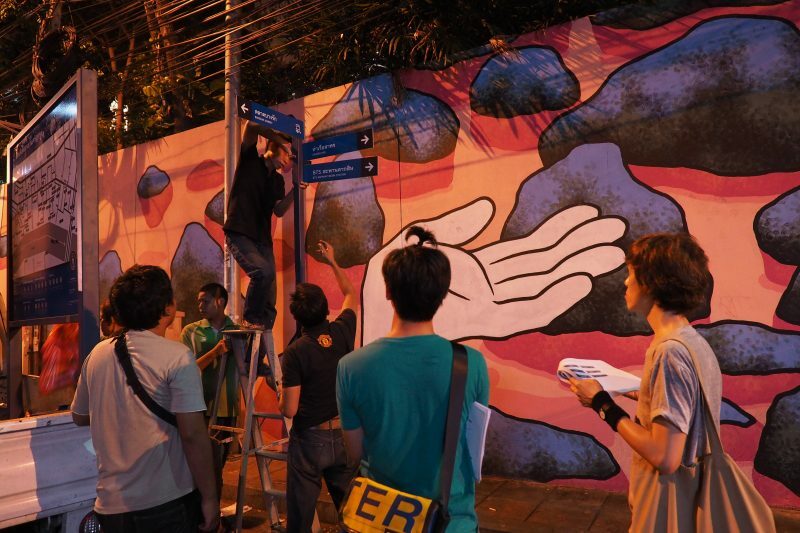 Initially the project’s scope was divided into 3 main parts: first, we started studying the creative district development approach based on economic and social development perspectives by analysing case studies of creative districts worldwide, including Thailand and Charoenkrung specific contexts. We then organised brainstorming activities with the stakeholders in the district using a Design Thinking-oriented methodology, our main development tool. 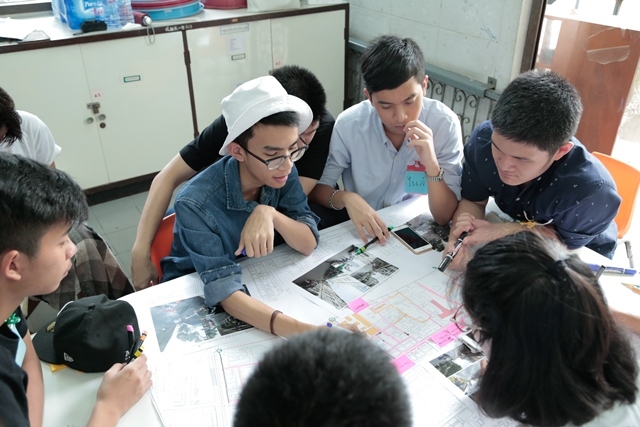 Lastly, we translated the insights into a ‘Co-Create Model' that caters to the Charoenkrung area by using a co-designing process to present the creative space development model through an on-location ‘prototype’ and listening to every stakeholder’s opinion and evaluation. It’s important to underline that the scope of the study is only a preliminary working framework. The creative district development process we are currently developing still requires to look at several other factors: from project development planning, budget and working period to public/private/community policies that align with local needs as well as concrete cooperation in the drive to develop a creative district. DF: What did you set out to achieve when you launch Co-Create Charoenkrung? How did this idea take shape and how did you make it possible? We believe that everyone is creative. The “Co-creating” process we have initiated is the key to bring about changes. Not everyone is a designer, but having designers and stakeholders working together within a framework of collective creativity will broaden the creative limits and expressions so that the locals’ experiences and ways of life can be naturally engaged. 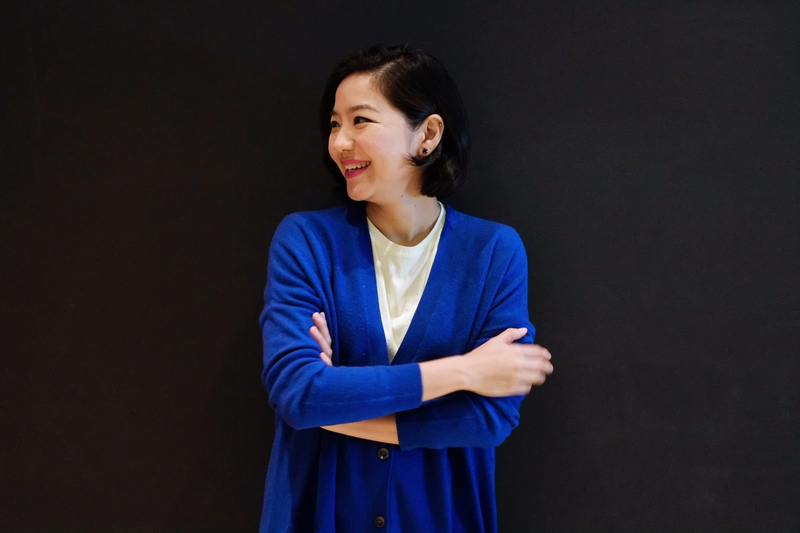 The first stage of the Co-create Charoenkung Project has been conducted for one year, starting from July 2015 to June 2016, focusing on co-creation between experts in creative city, designers and stakeholders in the neighbourhood, which in my opinion is the key to create change. The role of the designers in the project was as the facilitator. The stakeholders are not only the eventual users but also we see them as participators by helping showing problems, developing opportunities and exploring neighbourhood needs. Co-designing the creative district, then, leads to the concept of project development in various forms, including specific activities. DF: What kind of activity have been developing since you started Co-Create Charoenkrung Project? Gathering community’s opinions: Seeking valuable information for developing creative district through Service Design, together with the community and other stakeholders. Community’s creativity stimulation: Designing and building a creative district through inspirational activities encouraging creativity in problem solving, in order to improve community and people in the area’s quality of life. Creative Charoenkrung: Inviting community, thinkers and creators to create atmosphere of change and building a strong connection between people in the area and other organizations. Public communication: Introducing the Charoenkrung Creative District through printed media, social media and videos broadcasting the concept of activities and creative thinking process. DF: Which kind of development concepts have emerged after the initial research process? Riverfront public area development project: Reviving old riverfront architecture to a new landmark of the district and connecting both main and minor transportation routes to the riverfront. Abandoned building renovation and development project: Using the area to its highest capacity as district’s new meeting space for hosting creative people incubation activity. Small green space development project: Developing underused space into district’s public green space for meeting and activity. Alleys connection project: Connecting main and minor transportation routes for accessibility in the area to stimulate economy in the alleys. Signage for a ‘Walkable District’ project: Providing the information of travelling spots, business areas, restaurants and interesting spots with the signboard reflecting the identity of the area to draw people to the area. 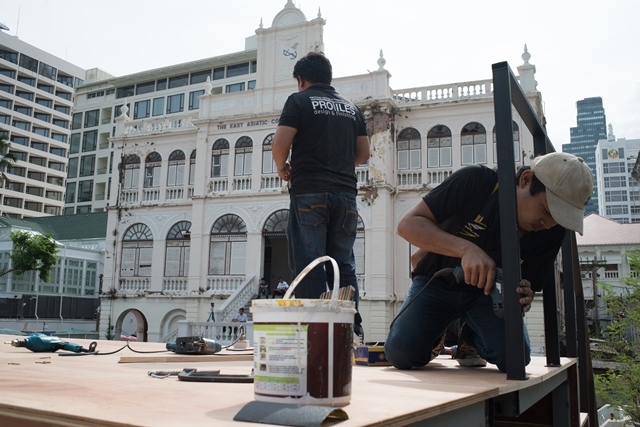 DF: In your opinion what is the ultimate result of the Co-Create Charoenkrung Project? The ultimate result of our project offers not only the concept of Charoenkrung creative district development, but also "Co-creation model” of designing creative district which can be applied to other creative district in Thailand. This is meant for the creation of creative district in various dimensions; business, design and community activity arrangement, which drives social and economic value to the community and surrounding neighbourhood. 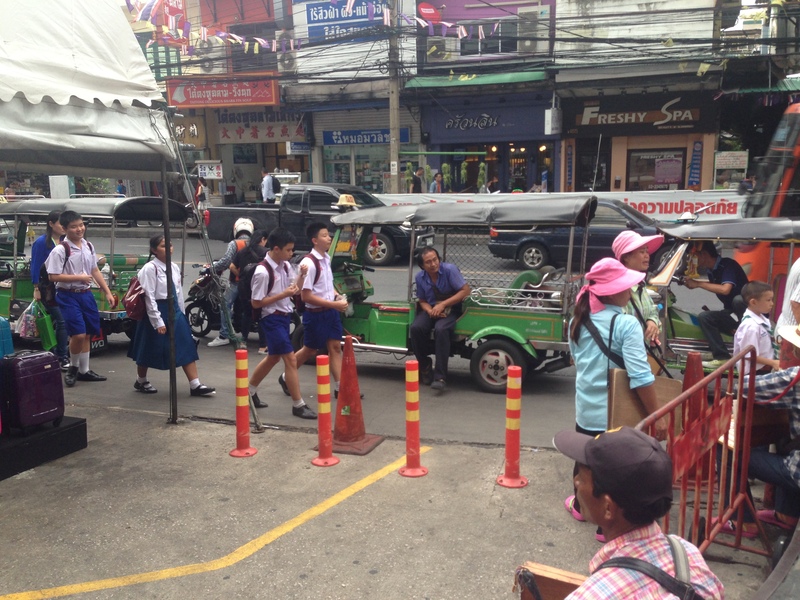 DF: While developing the Co-Create Charoenkrung Project, have you recently encountered any major drawback / disadvantage? One important drawback is the fact that the district lacks the link in the context of space, time and social interaction. This is evident from a great number of underused spaces and buildings, usually overlooked or receiving no value creation efforts and where access is limited. It also lacks green spaces and central public spaces. The period of time spent in the area is limited. The district is only lively during a certain time of the day. Furthermore, nowadays the district still lacks the incentives to draw people into the area. The district’s history and heritage has not been continuously publicised, which hinders the awareness of both locals and non-locals. It also lacks the link to primary and secondary transport systems, which impedes accessibility even though there are many public transport routes to the area. DF: What are your plans for the future of Charoengkrung, do you have any specific goals for the future? The main goal is to revive the district into a lively place. I think by renovating the unused buildings into public space, green space, waiting area, gathering space and local creativity incubator will help attracting locals to spending both day and night times in the district. I believe it will also enhance the quality of life by connecting transport systems, physically renovating the roads to become walkable, well-lit, safe and easy to access important sites. Moreover, the development of riverside public space in front of old, valuable architectures coupled with the signage system that reflects Charoenkrung’s identity will create new recognition and draw non-locals into joining creative activities. As a result, that will promote interaction between local and non-local creative people and investments by both Thais and foreigners. This more colorful and inspiring area will become a new destination for Thai creators, which is inductive to a self-sustainable creative district.